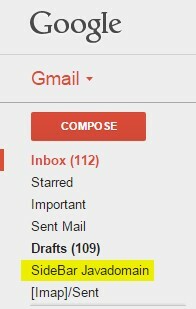 Extension in Gmail ? Where can I find it? 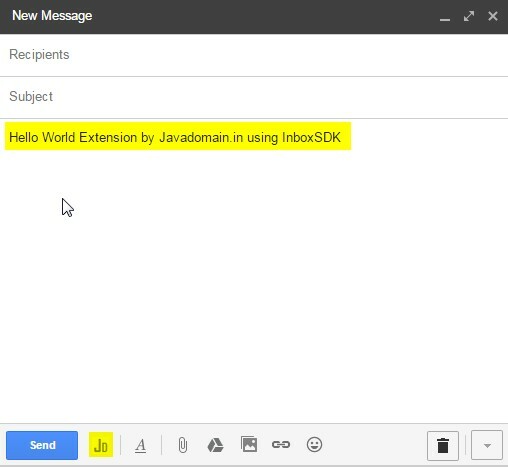 How to develop a hello world extension using inbox SDK for gmail ? How to Load our JS ? 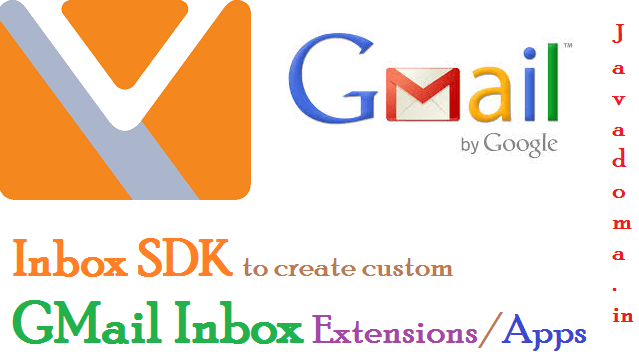 InboxSDK is a platform to develop extensions/plugins for gmail inbox. 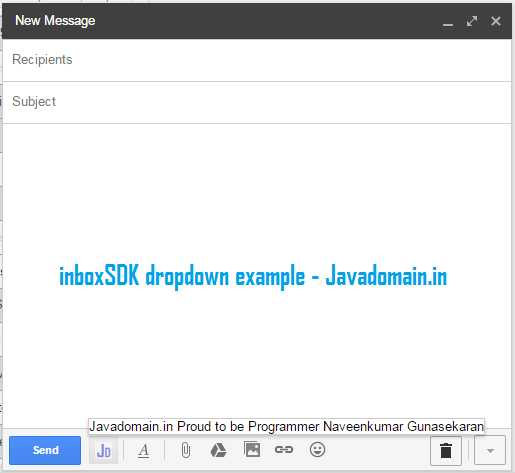 It’s just a single JS file which you can download from InboxSDK. App ID [It can be registered here, AppId Registration]. Place where we need to load the inboxsdk js and our own js[here myapp.js – main logics/business] file. Keeping myapp.js file in local is not recommended one, because when you are updating something in your myapp.js then all the existing users whoever added your extension in their chrome extensions need to update this plugin to sync with the updates you provided. 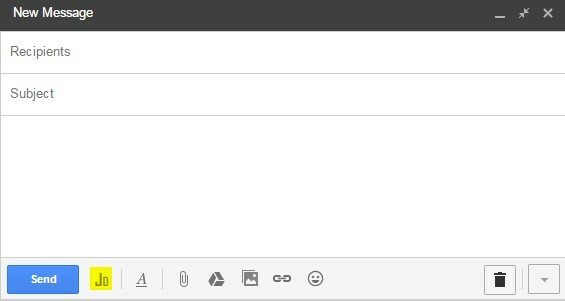 This is the most recommended way, because when you are providing any updates, then users do not need to update their extensions all the time, since the myapp.js file is already loaded from your own server. So changes will be in sync always. Please find the remote myapp.js file example at the bottom of this page. 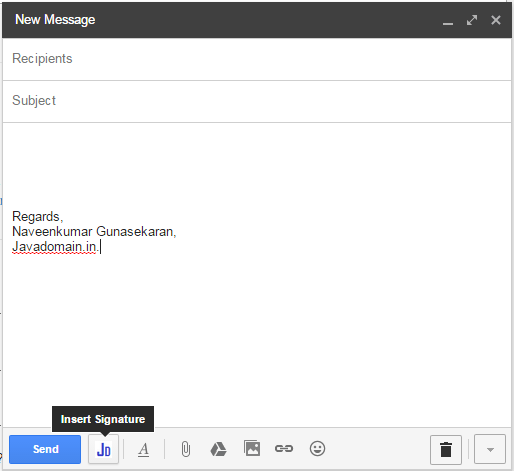 // Onclick of the button signature will be added into the mail content. Loading the above moved server file[myapp.js] in the local js file. Path of the moved myapp.js file should be given in the local jdhello.js file. Need to give the server name [demo.ngdeveloper.com] and local js file [jdhello.js], which loads the server myapp.js file. As per the inboxsdk site documentation, as of now it supports chrome and safari. Firefox support is in progress, we can expect it soon. what it does and uses?